The Magic Trackpad 2 is just one of the three latest accessory updates from Apple, the other two being the Magic Mouse 2 and the Magic Keyboard. Of all three, the Magic Trackpad 2 was the one I was most interested in and decided to pick one up earlier this week. It doesn’t fail to disappoint and brings the power of force touch and force click to the Apple desktop line. The Magic Trackpad 2 sports a new design along with a rechargeable lithium ion battery (finally!). However it comes it at a hefty price tag of €149, so is it worth the investment? I have used the original Magic Trackpad however I never bought one for myself. If you are looking to upgrade from the original you will find that the Magic Trackpad 2 is better in every way. It is bigger, sturdier, supports force touch and has a built in rechargeable battery. It excels over its predecessor in all areas. However with a price of €149, you have to really want it. I was concerned before buying it if I would actually enjoy using it over the Logitech MX Master which has been serving me well for the past number of months. Happily I can report that is no longer a concern, I prefer the trackpad input over the mouse and the Magic Trackpad 2 is not an investment which I am going to end up regretting. 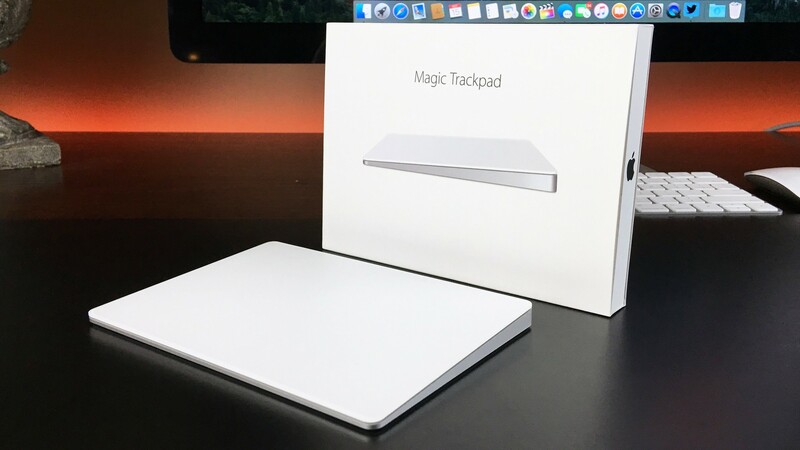 The Magic Trackpad 2 is a rectangular wedge which is low at the front and high at the back. Interestingly, Apple decided to go with a white finish as opposed to aluminium. On the rear of the trackpad there is an on/off switch, lightning port for recharging and a plastic window to allow bluetooth signals in and out. The actual casing is made of aluminium and the top is white glass. The surface of the trackpad is 29% larger than the original and unlike the original, there is no need to have empty space below the trackpad as disposable batteries are no longer needed. Instead it is a solid elegant wedge. The new larger size of the trackpad means of course it does take up slightly more desk space however the functionality makes it worth the sacrifice. The Magic Trackpad 2 comes with a lightning cable which will allow you to recharge the trackpad. When fully charged, Apple claims you will get over a month of regular use with it before needing to plug it in again. The same pressure sensitivity that is present in 3D touch on the new iPhone range is also present in the Magic Trackpad 2. A soft press and a hard press will allow for different functionality on the trackpad. Apple is also providing developer access to the force touch features on the Magic Trackpad in OS X so we will hopefully see other apps taking advantage of it. There are four sensors in the trackpad which register how hard you are pressing and a taptic engine will return haptic vibrations in response when you press. I had no interest in buying the first trackpad Apple released however I was quick to snap up this one. The consumer has to decide where the value is for themselves personally, no device is a waste of money if you have a use for it. If force touch is something you want to have on your iMac well now is the time to go and pick up one of these trackpads because you can finally have it. We know by now that Apple devices don’t come cheap but if you have the cash to spare for the Magic Trackpad 2 then you are in for a treat. You can buy it from Apple at the link below.